An antique Hanukkah menorah (c. 1750) at the Museum of Fine Arts in Boston. DECEMBER 28, 2017 – BOSTON – In a sign of commitment to developing its Judaica collection, the Museum of Fine Arts has hired its first full-time Judaica curator, a decision the museum hopes will allow it to build momentum on the gains it has made in this venue during the last decade. Matthew Teitelbaum, the museum’s director, announced the appointment of Simona Di Nepi as the Charles and Lynn Schusterman Curator of Judaica, and introduced her publicly on Dec. 13 at the MFA’s celebration of Hanukkah, a free cultural gathering that attracted hundreds of people. Originally from Rome, Di Nepi began her MFA position about three weeks ago, arriving in Boston from Israel, where she previously worked as a curator of the medieval and early modern European galleries at Beit Hatfutsot, The Museum of the Jewish People in Tel Aviv. She also has held curatorial positions at The National Gallery, the Royal Academy of Arts, and the Victoria and Albert Museum, all in London. The collection of 119 objects, donated in 2013 by Lynn Schusterman, a philanthropist to many Jewish causes, put the MFA on the map with a wide range of mostly ritual objects used in the home, spanning from the 18th to the 20th century. 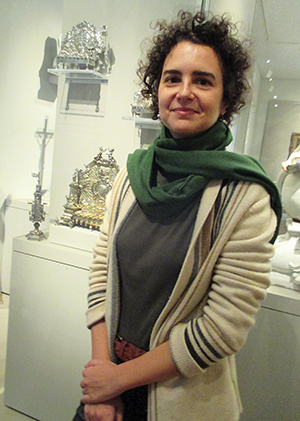 Simona Di Nepi has been appointed Curator of Judaica at Boston’s Museum of Fine Arts. Currently, there are about 15 Judaica objects on display in galleries throughout the museum, an approach that puts the objects in context with other works from similar periods, rather than displaying them as religious items on their own. Hiring a full-time Judaica curator is welcome news, according to Jonathan Sarna, the noted professor of American Jewish history at Brandeis University who is chief historian for the National Museum of American Jewish History in Philadelphia. “This demonstrates the museum’s commitment to maintaining and growing its Judaica holdings, and to integrating them throughout the museum,” Sarna wrote in an email. On the seventh day of Hanukkah, Di Nepi, a warm and engaging conversationalist, spoke with the Journal about her new position at the MFA and about settling in Boston, where, she admitted, the winter weather is not the balmier climate of her native Rome or Tel Aviv, where she’s lived for the past seven years. “It’s incredibly exciting to be at the MFA. For me, it’s such an enormous opportunity to do so much,” Di Nepi said. Judaica “is a very functional kind of art. It is made to be used,” she said. The MFA’s collection is comprised largely of domestic items, but Di Nepi admires that it boasts a wide range of styles and genres, with paintings, metalwork, ceramics, glass, and textiles. 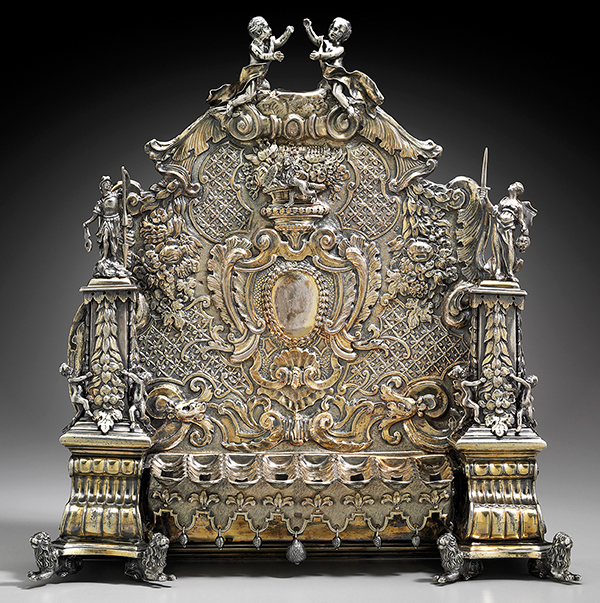 In just a few weeks in Boston, Di Nepi has become very fond of a stunning handmade silver Hanukkah lamp that shines out from behind a glass display in the MFA’s Angelica Lloyd Russell Gallery that is devoted to 18th century European decorative arts. The ornate, Rococo style Hanukkah lamp, made in Aubsurg, Germany, dates to the mid 18th century, and was acquired by the MFA in 2009. It was likely made by a non-Jewish silversmith because at the time, Jews were not allowed in Europe’s silversmith guilds, Di Nepi pointed out. Two smaller, less elaborate silver Hanukkah lamps that are part of the Schusterman collection also are featured in the display, along with two intricately detailed silver spice towers used during the Havdalah ritual at the close of the Sabbath. A pair of lovely Delft ceramic plates for Passover and Sukkot are on view across the gallery, where visitors can see the largest number of the MFA’s Judaica in one space. In the Daphne and Peter Farago Gallery, Di Nepi pointed out two pieces of contemporary Judaica, a spice container by Korean-born artist Chunghi Choo, and a silver Miriam’s Cup by Lexington artist Cynthia Eid, whom she met at the Hanukkah program. Both evoke a modern, abstract style. The contemporary works bring to light the evolving nature of Judaica, Di Nepi said. “Is it only traditional or are we allowed to innovate?” It’s among the thought provoking questions that Di Nepi and other Judaica curators ponder, she noted. For now, Di Nepi is eager to study the collection in depth. But over time, she is looking forward to putting more objects into the galleries, collaborating with other institutions for loans, and to widen the public’s awareness of Judaica. She hopes to work closely with the education department as well. “There is so much that we can do,” she said.  Thanks for this fine article. I am looking forward to seeing these pieces and more at the MFA and am pleased that Di Nepi has joined the curatorial team.